NEW YORK -- They are the neighborhoods Jane Jacobs saved: Greenwich Village, Washington Square, Little Italy, and SoHo. And they are, not coincidentally, some of the most valuable urban real estate parcels anywhere, and some of the places most cherished by New Yorkers and visitors alike for their cozy charm and architectural splendor. Nearly a half century ago, New York’s master builder, Robert Moses - the man who built Jones Beach, Shea Stadium, the Triborough Bridge, and the Central Park Zoo, to name just a few of his grand public works - was ready to transform the landscape south of 14th Street in Manhattan. He wanted to extend 5th Avenue through Washington Square Park with a four-lane roadway. He started the engines of the bulldozers of urban renewal in the West Village. And he dreamed of an elevated, 10-lane highway down Broome Street: the Lower Manhattan Expressway, connecting the Holland Tunnel and East River bridges, which would have decimated hundreds of buildings and untold jobs, and uprooted families along the way. Jacobs, the self-proclaimed untrained house wife from Scranton, Pa., stood up to Moses on all three counts, arguing that these places had value and should not be razed. Her legacy is evident in a walking tour of the traditional blocks and human-scaled streetscapes that flourish today. The potential of what Jacobs saw so many years ago has blossomed with white-hot energy, beginning with The Standard, the fabulous and striking hotel in the Meatpacking District that towers over an elevated park, the High Line. The key intersection is 14th Street and 6th Avenue - look for the Apple store, and head southwest toward Gansevoort Street - and The Standard rises like a propped-up book amid the purveyors of pork and lamb. The view from the bar at the top, across the Hudson River in one direction and up to the Empire State Building in the other, provides some orientation. The High Line, an old freight train line, has recently been turned into an elevated park so popular that visitors have to be timed to enter. The High Line runs south and then abruptly stops, near the Richard Meyer condo towers and the West Village Houses, the unassuming low-rise affordable housing project that Jacobs helped set in motion in the 1960s. Today Sarah Jessica Parker and Gisele Bundchen and Tom Brady stroll the area. Back then Jacobs realized the neighborhood was going to get very pricey. The entire area was set to be designated a slum and razed for housing towers before Jacobs mobilized the neighborhood in opposition. Headquarters for the effort was the Lion’s Head, later the Monkey’s Paw, and then Kettle of Fish. A few steps away is the Christopher Street-Sheridan Square subway stop on the No. 1 line, where Jacobs first alighted in the 1930s and discovered the neighborhood of her destiny. She first lived on bucolic Perry Street and then Washington Place, in the building where the writer Willa Cather lived. 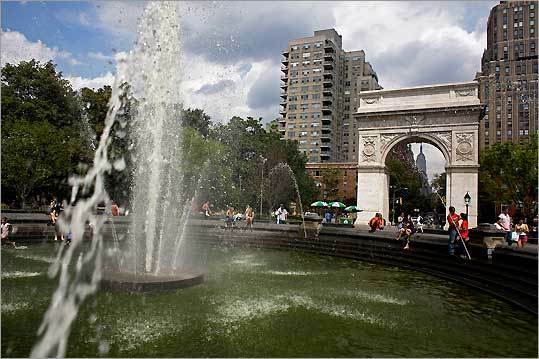 Nearby Washington Square Park, celebrated by Henry James as a comfortable outdoor living room in the heart of Greenwich Village, was for Jacobs and all the denizens of the Village a respite of green and open space, with playgrounds for her three children, spontaneous outdoor concerts for folk singers including a young Bob Dylan, and soapbox orators. New York recently renovated the 10-acre greensward, moving the centerpiece fountain into alignment with the picture-postcard arch built to honor the first president. If Moses had had his way, a roadway would carry traffic through the heart of the park to what is now LaGuardia Place, site of the towers in the park of Washington Square Village, adjacent to Philip Johnson’s Bobst Library and other buildings of New York University. The walk past these massive housing towers across Houston Street leads to SoHo - south of Houston Street - one of the greatest urban success stories in the country, and today a must-see neighborhood for any visitor to the city. Fifty years ago, the neighborhood was known as “Hell’s Hundred Acres’’ because of the fires that started in abandoned cast-iron-facade buildings used for manufacturing and warehouses. Moses had given up on the neighborhood, deeming it an appropriate place for the Lower Manhattan Expressway. But Jacobs saw the value of the urban fabric that he sought to demolish. Of the many jewels along Broome Street, the proposed route of Lomex, as the highway came to be known, is the Haughwout Building, a department store that featured the first passenger elevator, the invention that in turn led to the modern skyscraper. The Italianate facades of these “palaces of trade’’ make a walk along Broome Street a dizzying experience, all the more incredible while imagining that an elevated highway might have been built there. The Church of the Most Holy Crucifix, whose pastor, Father Gerard Lamountain was a key Jacobs ally in the expressway fight, would have been gone. The Church of San Salvatore, the Engine Company 55 fire station, and the Beaux-Arts style Police Headquarters building, today home to New York Review of Books founder and Jacobs’s editor, Jason Epstein, also would have succumbed to the wrecking ball. Little Italy and the Lower East Side, home to the Tenement Museum honoring the life of immigrants in New York, would probably have suffered the abandonment of the South Bronx, where Moses built the Cross-Bronx Expressway. Sara Delano Roosevelt Park, named for FDR’s mother, would have been the spot where Lomex split in two, to connect to the Williamsburg and Manhattan bridges. The foundations for the megaproject still lie deep underground at Chrystie and Forsyth streets; today this would-be intersection is the site of pickup soccer games and the colorful markets of Chinatown, which has gradually expanded north across Canal Street. The tour ends at Seward Park High School, where Jacobs was arrested and later charged for inciting a riot, after disrupting a public hearing on the Lower Manhattan Expressway in April 1968. Later that year, Jacobs left New York for good, settling in Toronto for the rest of her life. She only sporadically returned to the city she fought to preserve, and died in 2006 at 89. The urban wonderland, from the Meatpacking District to the Lower East Side, is what remains. Anthony Flint, author of “Wrestling With Moses: How Jane Jacobs Took on New York’s Master Builder and Transformed the American City,’’ (Random House, 2009) can be reached at anthony.flint@gmail.com. Seasonal British & Italian dishes using local ingredients. Burger and bitter $9-$24. Frequented by bohemians and Jane Jacobs, who lived just down the block, $6-$12. Nestled amid the cast-iron-facade architecture of SoHo, $11-$30.